Holiday Autos, an online car rental firm, tested and developed a new interface for their online booking service in order to increase sales in a competitive industry. The company's usability research with eye tracking enabled them to drastically reduce the typical ordering time by two-thirds and increase their customer conversion rate by 20%. Holiday Autos is the world's leading car rental comparison website. Therefore, the quality of their online presence is of utmost importance to their business. For some time, Holiday Autos had noticed problems with their booking process and received numerous complaints, mostly about its time-consuming ordering procedure. To examine the reasons for their stagnated sales in an otherwise growing industry, the company contacted Mårten Angner Interface & Design. After an initial qualitative test of Holiday Auto's website, it was apparent that a completely new interface and booking process was necessary for improvement. Several usability tests were carried out over the course of the development process. The company wanted to regain their customers' confidence and increase their online rental sales with a better interface. With the newly-designed website, researchers were able to study the user experience and improve Holiday Autos' web ordering process. The results were easier ordering for customers and increased sales for the company. In a highly competitive market like that of online car rentals, users demand swift and outstanding interaction with their online service providers. 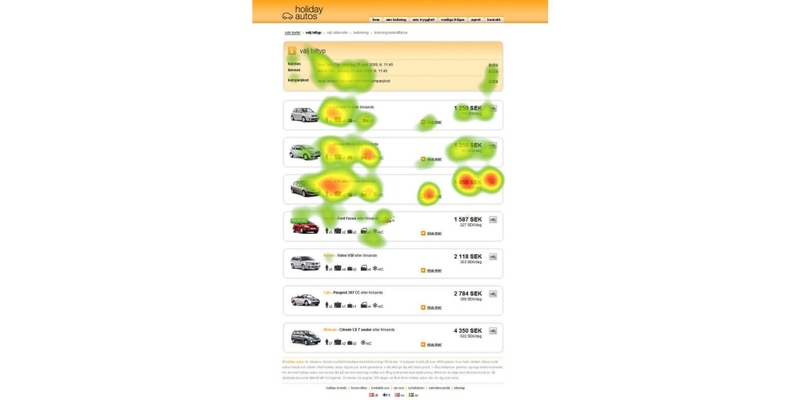 With eye tracking from Tobii, not only could we guarantee usability of the site, but also how every graphic design element contributed to a positive online renting experience. An initial qualitative usability test of the original ordering interface was conducted using the Tobii Pro T60 eye tracker to gather gaze data. Participants were asked to go online and book a car for their upcoming international vacation. Numerous discrepancies were detected. Some respondents did not even complete the order due to confusion and frustration. The revised opening page guided users straight to rental with Holiday Autos' promotion on the side. An "order progress box" was introduced so users could keep track of decisions made and feel confident that their choices had been processed. After choosing a car, a new rental upgrades pop-up feature was introduced. Language was revised, removing unnecessary text which was confusing the users. The amount of text in the ordering process was reduced, especially regarding local regulations not relevant to the destination at hand. In the final stages of development, eye tracking was used again as quality assurance in the validation process. Although the new design performed really well overall, the data analysis revealed a few flaws to be resolved before Holiday Autos' new online ordering tool could be launched. 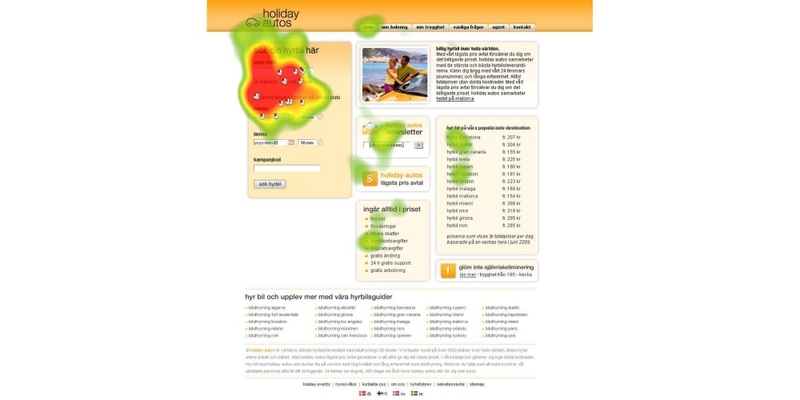 Eye tracking pinpoints usability issues like no other research methodology can come close to doing. 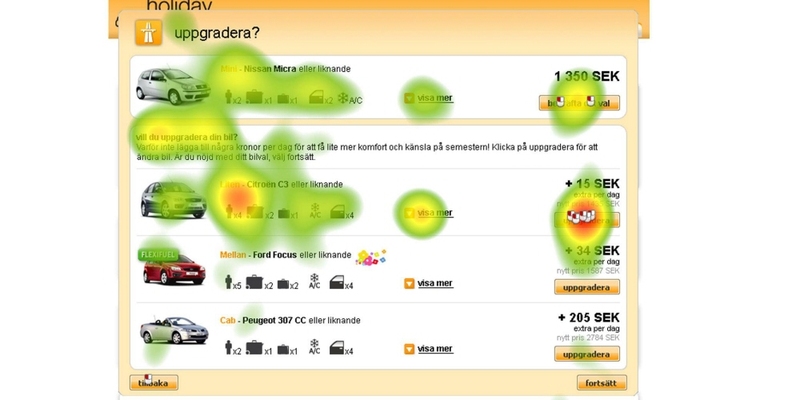 Furthermore, eye tracking data becomes a tool for visualizing business opportunities to improve the user experience. One of the issues eye tracking revealed was that the promotional text on the new initial ordering page was completely ignored due to its placement. Moving this savings offer to a different location on the screen gave it the intended customer focus. Another problem was in the graphics in the new ordering tool. Holiday Autos uses a gradient orange together with white in their branding. These two colors were used in the "car choice" section to highlight certain areas. The eye tracking detected mistakes in this color usage. The "upcoming choices dialogue" was then changed to white instead of orange, making important areas lighter. The "order progress box" was made orange and became a friendly reminder that shifted user attention to the decision at hand. Often in e-commerce, user attention seldom lands on the first product choice. Instead, focus is drawn to the second and third alternatives regardless of the price or quality. The new color options emphasized where the company wanted the users to look on the page. Knowing that the first product never attracts attention, the challenge in the "upgrade" section was to make customers notice the slightly more expensive, nicer option while still acknowledging their original car choice. By making the chosen vehicle white and separating it with an orange line, attention was diverted to the upgrades, leading to more sales for Holiday Autos. Due to these findings, the time it took to book a car was drastically reduced and respondents had no difficulty in completing their orders. Specifically, Holiday Autos managed to cut the order time by two-thirds which increased their conversion rates by 20%.